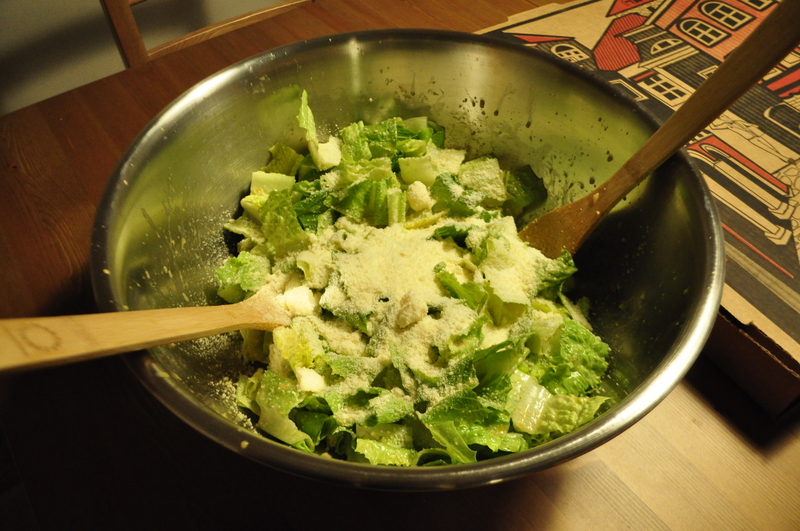 This is pretty much everyone’s favorite dish that Chris makes- the caesar salad. “This is the best caesar salad I’ve ever eaten” said our friend on Sunday night when we had them over for pizza and salad. It was a “cheat weekend” for us, so don’t judge us for falling off the Paleo/Primal wagon. Chris didn’t make the pizza from scratch this time, but that will be in a post soon for the Non-Paleo in us all! This salad can be a meal in and of itself, with the creamy and cheesy dressing that lavishly coats each piece of romaine lettuce. However, this salad makes a great side dish with a nice juicy steak or a perfect plate of pasta, among many of your other favorites. Take the three heads of romaine lettuce and thoroughly rinse with cold water. Allow water to drain from lettuce before cutting into 1 inch pieces and placing in the large mixing bowl. Place bowl in refrigerator until your ready to mix the salad. Start with partially cooking the egg. Place the egg in a small saucepan on medium-high heat until the water begins to boil. Watch it carefully, as this step is time-sensitive. Once the water begins to boil, allow the egg to boil for 2 minutes and immediately run the egg under cold water to stop the cooking process. Drain water and set aside. 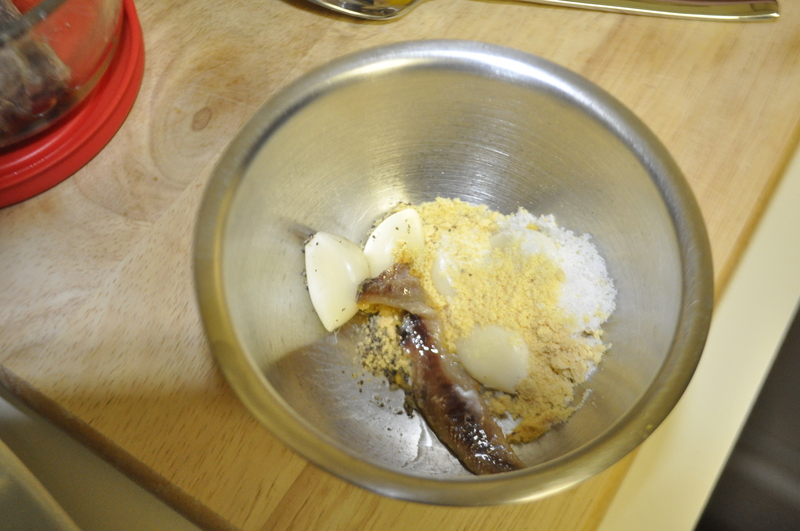 Place garlic gloves, salt, pepper, mustard, and anchovy filet in mortar. Slowly begin to smash the ingredients with the pestle. Take your time or else this will get messy quick. Smash until a paste is made and the ingredients are well combined. 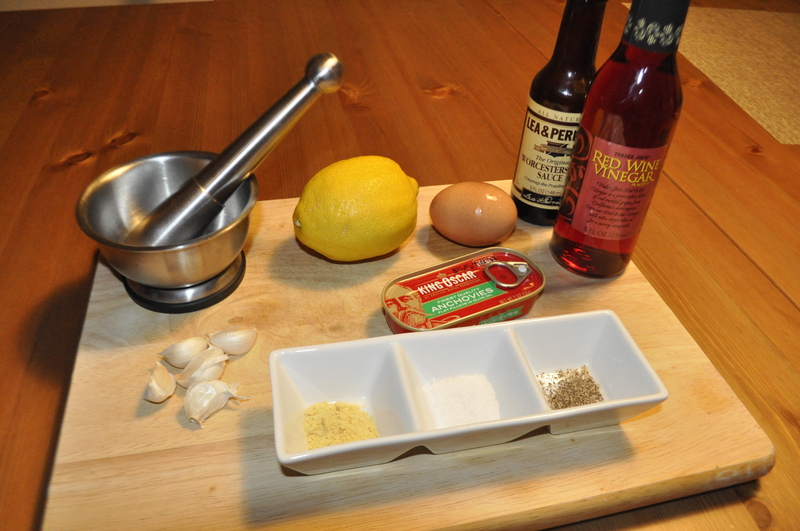 In the small mixing bowl combine red wine vinegar, worcestershire sauce, garlic paste from Step 2, and squeeze juice from lemon. Take the partially-cooked egg and carefully crack it open to separate the egg yolk. Add ONLY the egg yolk into the mixing bowl. Now you can whisk the ingredients together as you slowly pour in olive oil. The dressing is ready! Now we’re ready to put it all together… Mix in the dressing with romaine lettuce until lettuce is evenly coated. At this point your ready to pour the cheese in and continue to mix the salad A LOT. Just when you think it’s all mixed and ready to eat… mix it some more!! The final touch is cracking some fresh pepper and BUON APETITO! This recipe serves 4 to 6 people.